1.It is indeed a privilege for me to be present amidst you this afternoon when you are celebrating the fiftieth year of the Delhi High Court. A moment such as this is truly historic for any institution. My compliments to all of you on this occasion! 2.The High Court of Delhi has its origins in the High Court of Judicature of Lahore, which was established on 21st March, 1919 by a Letters Patent. The Lahore High Court had exercised jurisdiction over the provinces of Punjab and Delhi. Upon India’s Independence, the High Courts (Punjab) Order 1947 was passed. It led to the establishment of a new High Court for the territory, which was then referred to as East Punjab. The High Court of East Punjab was situated in Shimla and functioned from a building called the 'Peter Hoff’. The High Court of East Punjab, which later became the High Court of Punjab, exercised jurisdiction over Delhi via a Circuit Bench. 3.Having regard to the population of Delhi and its status as the national Capital, it was felt appropriate to establish a new High Court for the territory of Delhi. On 5th September 1966, the Delhi High Court Act was enacted. Section 3(1) of the Act empowered the Union Government to set up through a notification in the Official Gazette a new and exclusive High Court for the Territory of Delhi by the appointed date of 31st October, 1966. To begin with, the Delhi High Court had exercised jurisdiction not only over Delhi but also Himachal Pradesh. In a reversal of fortunes, the Delhi High Court had a Bench in Shimla, located in a building called 'Ravenswood'. This continued until the enactment of the State of Himachal Pradesh Act, 1970, which came into force on 25th January, 1971. 4.The first Court of the Delhi High Court comprised Chief Justice K.S. Hegde, and three Judges, Justices I.D. Dua, H.R. Khanna and S.K. Kapur. They all made stellar contribution to the cause of justice. Three of them also adorned the bench in the Supreme Court. From a modest beginning, the Delhi High Court today has a sanctioned strength of 60 Judges, comprising 45 permanent and 15 additional judges. It has supervisory jurisdiction over 6 District Courts that exercises jurisdiction over 11 districts. 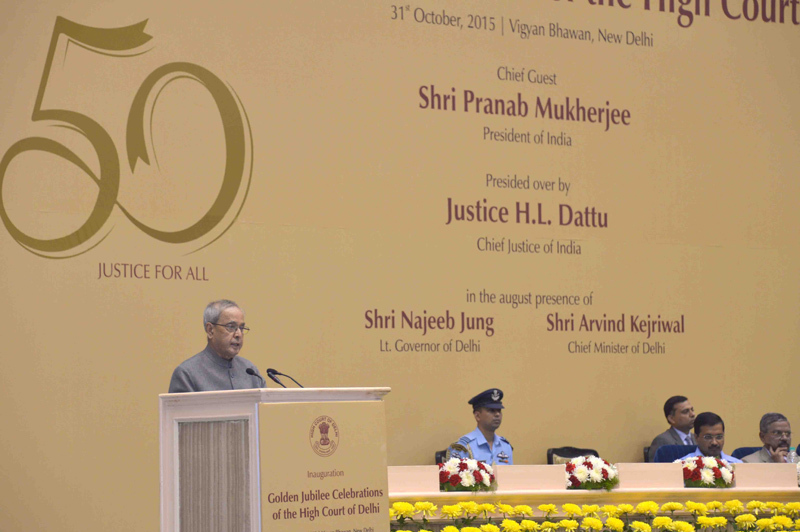 5.I am happy to note that the theme of the Delhi High Court’s Golden Jubilee Celebrations is ‘JUSTICE FOR ALL’. This phrase, to my mind, implies empowerment of the weak and equal treatment of law irrespective of one’s individual identity. India is a country of 1.3 billion people belonging to three ethnic groups - Caucasian, Dravidian and Mongoloid- speaking 122 languages and 1,600 dialects, and professing 7 faiths. Our country has thrived due to its power of assimilation and tolerance. Our pluralistic character has stood the test of time. Our ancient civilization has over the centuries accommodated our diversities. Multiplicity is our collective strength which must be preserved at all costs. It finds reflection in the various provisions of our Constitution. 6.Judiciary, which is one of the three important pillars of our democracy, is the final interpreter of the Constitution and laws. It must help maintain social order by swiftly and effectively dealing with those on the wrong side of the law. As an upholder of the Rule of Law and enforcer of the right to liberty, the role of the Judiciary is sacrosanct. The faith and confidence people have in the Judiciary must be always maintained. For justice to have meaning for the people, it must be accessible, affordable and quick. 7.Access to justice for the poorest of the poor would ensure ‘Justice for all’. It is worth recollecting here what Mahatma Gandhi had once said which I quote: "My notion of democracy is that under it the weakest shall have the same opportunities as the strongest” (unquote). Given the circumstances of our developing country, our judiciary has enlarged the scope of justice. For the enforcement of fundamental rights, the Supreme Court through judicial innovation and activism has expanded the common law principle of ‘locus standi’. It has been made possible for courts to permit anyone with sufficient interest and actingbona fide to maintain an action for judicial redress, and to activate the judicial process. In the support of rights, courts have found a post card or newspaper article to be material enough to set-off judicial action. This has helped to bring justice closer to the common man. 8.At the same time, judicial activism should not lead to the dilution of separation of powers. Each organ of our democracy must function within its own sphere and must not take over what is assigned to the others. In the exercise of powers by the legislature and executive, it is subject to judicial review. However in the exercise of powers by the judiciary, the only check possible is self-imposed discipline and self-restraint by the judiciary. The balance of power between the three organs of the state is enshrined in our Constitution. The Constitution is supreme. The equilibrium in the exercise of authority must be maintained at all times. 9.An affordable judicial system is a must for a country having many citizens at the bottom of the socio-economic pyramid. Article 39A of the Constitution provides that: "The State shall ensure that the operation of the legal system promotes justice, on a basis of equal opportunity, and shall in particular, provide free legal aid, by suitable legislation or schemes in any other way, to ensure opportunities for securing justice are not denied by reason of economic or other disabilities”. Voluntary efforts by all concerned are required to make this provision a reality. Greater efforts are necessary towards legal literacy. Instilling positive values in our young lawyers is vital. The Legal Services Authorities Act was enacted in 1987 to give a statutory base to uniform legal aid programmes throughout the country. Successive Chief Justices of India have played key role in enforcing the Act. Provision of free legal service to the weaker sections would provide a strong impetus to the cause of ‘Justice for all’. 10.Quick delivery of justice is the third in the trinity of an effective judicial system, the other two being accessibility and affordability. Delay in administering justice is as good as denial. There are over 60,000 court cases pending in the Apex Court, another over 40 lakh pending in the High Courts, and over 2.6 crore in the district and subordinate courts. The phenomenon of high pendency must change through multi-dimensional effort. Courts must have enough resources to boost their infrastructure. Vacancies in judicial positions must be filled up on priority. Having said that, expeditious selection must be no ground for sacrifice on quality. The appointment process must conform to the highest standards of probity. Whichever system of appointment we follow, it must operate on well-established and transparent principles to select the best. No one can meddle in the process. An autonomous judiciary is a vital feature of democracy. Yet being an important pillar of democracy, it must reinvent itself through introspection and self-correction, as and when necessary. 11.Litigation is often time-consuming. Alternative dispute resolution mechanisms like mediation and arbitration must be encouraged. In 2006, the Delhi High Court had created the infrastructure for court annexed conciliation and mediation calledSamadhan. Mediation centres have been set up in all district courts. Lawyers have been trained to take up mediation. The Delhi High Court also has court annexed arbitration, the first High Court in the country to do so. This has been extended to international matters through the Delhi International Arbitration Centre that has so far received over 1,000 references. The alternative dispute resolution methods have resulted in negotiated settlements bringing quick finality to litigations. 12.Technology solutions can fasten the process of justice and make it easier for the litigants as well. The Delhi High Court has pioneered the creation of electronic courts, the first of which commenced on 15th December, 2009. It started the e-filing facility on 25th October, 2013. Today, three jurisdictions of the Court - Arbitration, Company Matters and Taxation - are paperless. This High Court has started the practice of intimating the litigant and his counsel through SMS or e-mail the status of their filings. It has provided e-kiosks for litigants to access information about their case. Daily order sheets and final judgments are available on the internet. 13.Recognizing data retention as crucial to any Court, the Delhi High Court started digitization of records in 2007. More than five lakh case files have already been digitized creating extra physical space of over 45,000 square feet. Through collaboration with the Stock Holding Corporation of India, the Delhi High Court has allowed the purchase of court fees on round-the-clock basis through cheque, RTGS, bank transfer, net banking and debit or credit cards. These steps have resulted in optimization of resource use and greater efficiency in its conduct. I am sure other courts in the country have a lesson or two to learn from this High Court. 14.Examination of witness is a crucial element in the judicial process. On the basis of guidelines issued by this High Court, Delhi became the first State to formulate a Witness Protection Scheme. The Delhi High Court had introduced the Vulnerable Witness Court Room procedure to record the testimony of victims of sexual offence. Through segregation of the accused, it facilitates an environment where secondary traumatization of a sexual offence victim is minimized. After its inauguration on 16th September 2012, there are now four such court rooms, two each in Karkardooma and Saket District Courts. These court rooms have recorded testimonies and examined over 1,300 witnesses so far. To expedite adjudication, special Courts have been constituted by the Delhi High Court to deal with cases of atrocities against SCs and STs, sexual violence against children, fast-track courts to exclusively deal with cases of sexual offences and motor accident cases. 15.The Delhi High Court has earned a reputation for its superior standards and lofty ideals. Landmark judgments passed by this Court have strengthened the legal and constitutional framework of our country. It’s Bench and the Bar are known for their intellectual wisdom and legal scholarship. With each passing decade, the Delhi High Court has been served by Judges who have provided intellectual depth, vigour and vitality necessary to create a world-class institution. That this Court has contributed 25 illustrious Judges to the Supreme Court provides eloquent testimony to the high sense of duty prevailing amongst its Judiciary. I am confident that this Court would always remain the sentinel of justice. I wish the Chief Justice and the Judges of the Delhi High Court, the staff and members of the Bar the very best for the future.